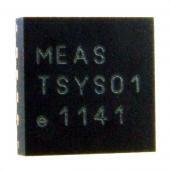 The TSYS01 digital temperature sensor has a high level of accuracy of ±0.1°C between 0 and 50°C. It is compatible with both I2C and SPI interface between the temperatures of -40 and +125°C. The TSYS01 Digital Temperature Sensor is in a package size of 4x4x1mm, and is ideal for Industrial Control, Heating, Cooling and HVAC systems.